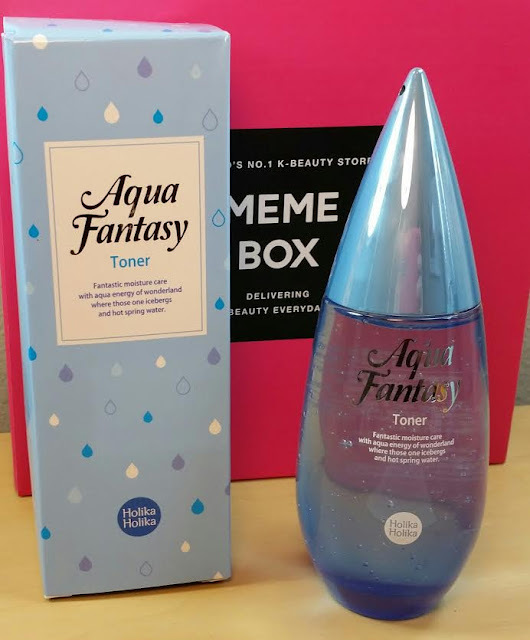 Holika Holika Aqua Fantasy Toner- 150ml- This is a pretty cool looking bottle I must say. It's shaped like a tear drop and it's made of glass so it's pretty heavy. This is a toner designed to cool, soothe and refreshed stressed skin. It's also supposed to calm red and irritated skin. I'm not thrilled that the third ingredient is alcohol. And I'm wondering what Onsen-sui is. That's the second ingredient. I know what an Onsen is... I went to one when I was in Japan but... Onsen-sui? I don't know. Oh, wait... the English bit says that it has hot spring water in it that must be what it is. I'm debating on using this just because I'm trying to avoid alcohol in my products to see if it helps reduce the redness in my skin. Also... I didn't know Holika Holika was owned by Enprani! Missha All Around Safe Block Aqua Sun Gel SPF 30-50ml- This uses several sunscreens, including Avobenzone. I personally prefer titanium dioxide and/or zinc oxide because they are so safe and rarely cause any kind of sensitivity or allergy. However, any sunscreen is better than no sunscreen and this is a gel. I actually really like gel sunscreens and I wonder why they aren't more popular with sunscreen companies here in the US. Gels tend to be so much easier to spread and much less sticky. Although, I suppose sticky is good when it comes to sunscreen because you don't want it to wash off. This sunscreen is loaded with antioxidants, as well. It does have alcohol in it so I'm going to set it aside for the moment while I'm conducting my tests. Secret Key Honey Bee's AC Control Foaming Cleanser- 130ml- This is a full size cleanser with bee venom,propolis, tea tree oil and salicylic acid to help relieve troubled skin. IF you've got acne prone skin this will help without drying. 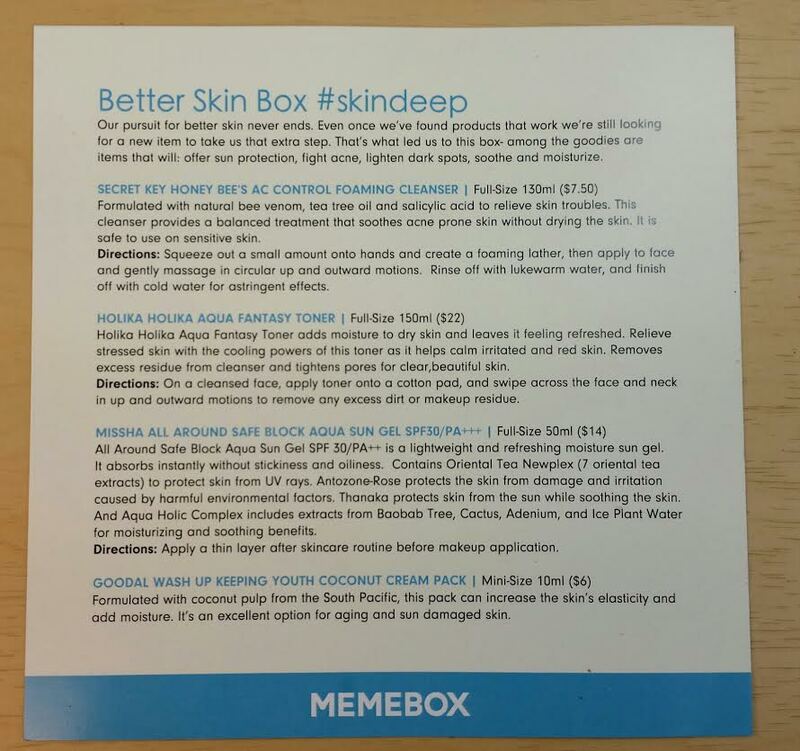 It's supposed to help maintain a normal oil moisture balance in your skin. I don't know if that is actually what it does (or how it works) but that's what it says. I'm curious what the pH balance of this cleanser is. Anyone know? I might have to open it up and try it. Okay. 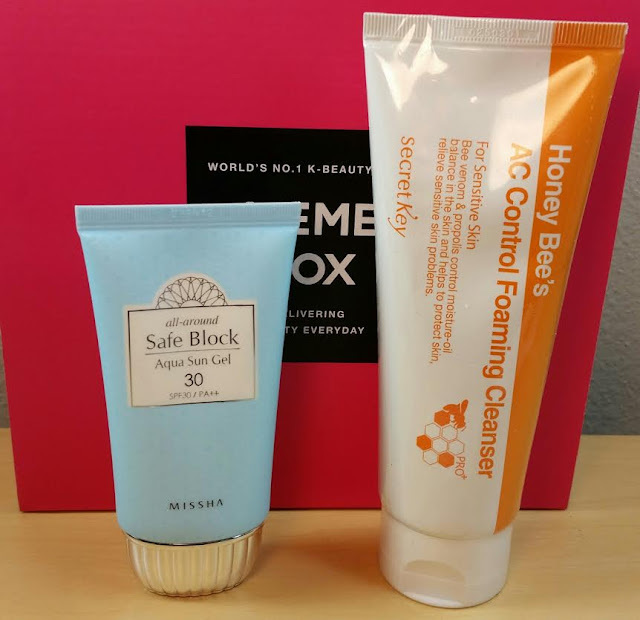 The pH balance of Secret Key Honey Bee's AC Control Foaming Cleanser is 10. Yup. 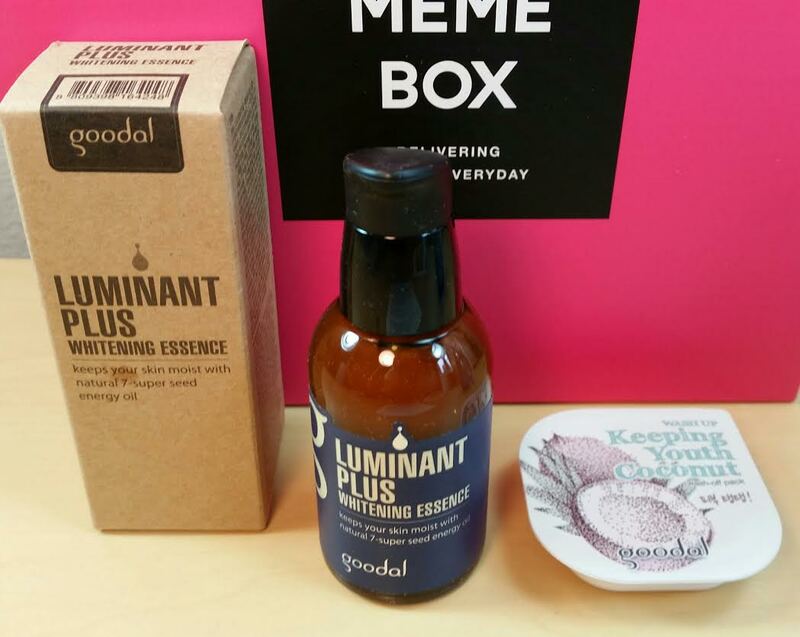 Goodal Luminant Plus Whitening Essence-30ml- This whitening essence uses niacinamide for evening out skin tone and controlling melanin production to decrease discoloration and dark spots. I love essences like this. It's very light, smells definitely herbal and leaves my skin SO soft! The only thing I'm weirded out about is that there is no "straw" to the pump the stuff out. Hm. This is an excellent brand and an excellent product and I'm excited to add it to my lineup. If I could get it out of the bottle, that would be even better. 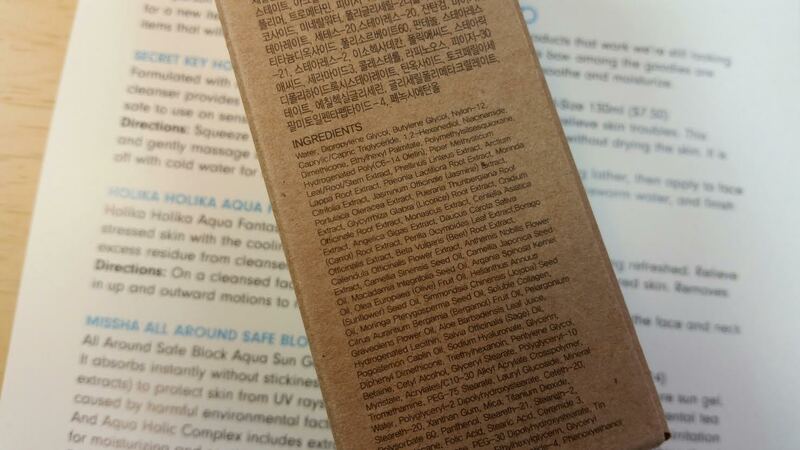 It also has the longest list of antioxidant plant extracts I've ever seen. Yay, Goodal! Goodal Wash Up Keeping Youth Coconut Cream Pack- I wish there was two of these. There should ALWAYS be two of a mask like this. You can't tell you love something with just one application. This particular one is for dry skin. It has coconut oil and argan oil in it. It also has yeast ferment which I like for soothing. I'm totally using this. You slather it onto a clean face, leave it for ten minutes then wash it off. VERDICT: Obviously a large part of the value of this box was the Goodal Whitening Essence. Luckily, it's a great product and I can use it (yay, no lavender!). I felt this box was fairly well balanced. I would have liked to see an actual moisturizer instead of a cleanser but getting a toner, essence and sungel is nice. As always, there should be two masks but I have a feeling I may be able to get two uses out of the Coconut Pack. I am very pleased with the brands represented in this box. I'm also glad there is no Memebranded stuff. I'm tired of it popping up in all the boxes even though I do like their lipsticks and the Pony quads. 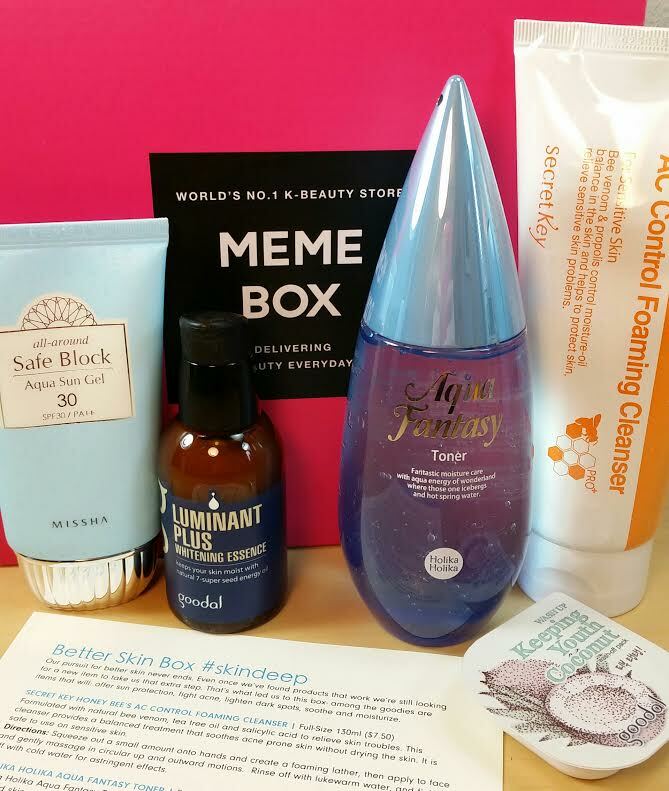 If you'd like to see what Memeboxes are available now, you can find them all right here. There are currently a few codes that will be working until the end of May. Use code ENJOY or COMEBACK for 15% off your order. 3x use allowed per month! 15% off your 1st Korean cosmetics purchase! Use code WELCOME. Don't pay full price if you don't have to! I've used the LOVEYOURSKIN code twice now with a Memebox and a skincare product in my cart and it still gives the full 15% off, too. This looks like a good box! But you have me paranoid about alcohol now... And I don't even have sensitive skin, but it does get really dry and flaky in the winter. Yessss!! I love Kerry! She's got a book coming out, too. She hasn't been blogging in awhile because of it. What I learned, I learned from her. Or a lot of it anyway. She's amaaaazing! I'm trying to avoid alcohol and pay attention to pH because it's supposed to be better for your skin. And because this dratted redness is driving me nuts. I will say that it's gotten a LOT better since I started so I'm thinking there's something to it. Most cleansers (beyond the oil ones) that I use are by Paula's Choice because they are pH balanced around 5 (where they should be). I also just heard about Mask Genie and thought of you. I have a feeling that masks might become my new big addiction... And/or Korean skincare. Oh boy!